Fittsie's Angels: Balloon Release Part 2 Life Changing Event For Me! Balloon Release Part 2 Life Changing Event For Me! My life has been changed dramatically since I have posted about my Balloon Angel Birthday Release. I have met some incredible mothers with stories that just touch my heart and soul deeply. I feel like I know these moms and just as importantly, their precious angel babies. e you sign up, I go read your story if you have on online for me to read. I get to know you and your baby so I can really feel I know the angel I am creating the balloons for. 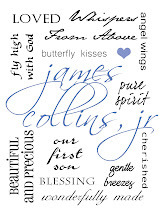 My husband James and I talk about your angels and speak their names so normally. 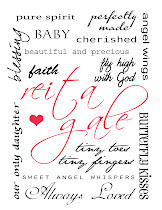 I know your angels have been greeted by our angels, James Collins, Jr. and Reita Gale. My Angel Birthday Balloon book is filling up and I love it. James has bought us a helium machine, we have bought & made enviromentally symbols to go on the ballons, plus have ordered at cost due to "The Party Place" hundreds of balloons. I can't put your art on your balloons until I blow them up. We have had some nasty weather that has prevented some Feb. releases. I can't decorate until shortly before release. However, I have planned what I am going to do and what you have requested so I can decorate quickly. 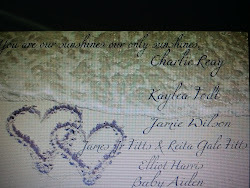 I will send pictures if you have given me your email address. Okay, I started by saying how my life has changed. Let me give credit to Catherine over at http://twinkleoflight.blogspot.com for reading my story and then posting a story about me! Please go read it. For the first time ever in my life since my babies were born, Catherine wrote about what is was like for me and other mothers in "our time of slience." When I read her post yesterday, I cried and cried. I wanted to scream out, "Finally my agony of having not a single soul to talk to about my babies has been recognized!" MY BABIES COUNTED THEN AND THEY COUNT NOW! Thank you Catherine! The release I felt of carrying the burden for almost 38 years now was incredible! Catherine has an incredible story herself you should read about her son, Gabriel. Through her site you can discover, Gabriel's Gardens. I have seen God work in Hannah's life over at www.roseandherlily.com. I feel everyone should read her story not only for the child you lost. but also for your rainbow baby and how you can help you rainbow from bullying. It starts so much earlier than you think. Try second grade! We have to prepare are rainbows as well as honor our Angels! Corbin's story over at The Pearl in the Oyster http://thecorbinstory.blogspot.com has left me with such respect for mothers who battle with many surgeries for their babies born with heart defects. James asked me what I was reading as I read Corbin's story. I told him I was reading about a tragedy we had no knowledge of. I have felt sorry for myself that one day I was was pregnant and the next minute a doctor telling me my baby was dead in my womb. Don't get me wrong. That was just horrible for us to go through, devastating especially with no support. Corbin's parents went through many weeks of ups and downs wondering if their Corbin was suffering. The end was the same result as mine or yours, he died. It took weeks. Mine died suddenly and swiftly. I just don't know how they did it. PLEASE LISTEN UP! iF YOU ARE EXPECTING A RAINBOW, DEMAND A PAINLESS PULSE OX or PULSE OXIMETRY TEST TO BE DONE ON YOUR BABY AT BIRTH! Not all states mandate this, you HAVE to ask for it. Passing is 95% or above. It determines if your baby has a heart defect that went unnoticed during pregnancy. It is a very simple test and painless. ALSO, at your 20 week ultrasound, ask about your baby's heart. For more infomation go to Corbin's Story with the address listed above. Since this is Heart Month several guess posts are on this site about baby's with heart disease. So many more Angel Stories to share with you that I will mention SOON. So many mothers! I am honored to met you all! I am WORKING on getting my own page on Facebbook about my Balloon Releases. Hoping to have it up and going very soon. I am having to learn and teach myself by trial and error. Remember, I am 62 and didn't grow up with the internet! I'm not a savy techy person! I am just thankful I know how to blog!!! God bless all of you in your grief and trials! Thank you once again for accepting me as an older mom and pulling me into your babyloss groups! You have blessed my life greatly! SO happy to hear you are excited about blogging and giving back it is so very helpful. You have a lovely heart that shines through your posts! I found your blog through Catherine's. I'm so sorry for the loss of your sweet babies, but so glad that you are finally giving yourself a space to grieve. Wishing you peace. Sadie, thank you for reading my blog. Peace to you also. I have visited your blog and want to go back to read more. What we all say is important! Hugs Sadie! I Need To Rant About Grief!